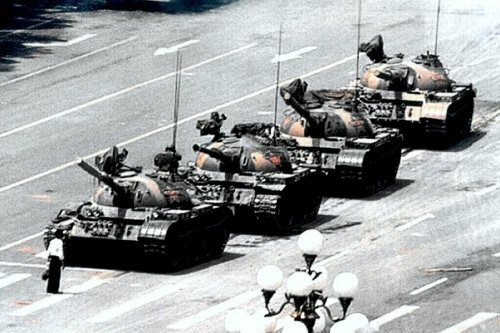 The iconic image of “Tank Man” facing down the Chinese army during the Tiananmen Square uprising of 1989. There’s a great essay forum over at Mobilizing Ideas reviewing and discussing research on why social movements fail. It features some of my favorite researchers on this topic and is likely to be interesting to many readers of this blog. Check it out here (h/t to the ever-awesome Jay Ulfelder for pointing it out). My personal favorite is Kevan Harris’ article on the 2009 Green Movement, which critiques the view that the movement failed primarily because of state repression. Kurt Schock’s book on Unarmed Insurrections, which usefully compares successful and failed pro-democracy movements in authoritarian countries in Asia. Sharon Nepstad’s book on Nonviolent Revolutions, which also compares successful and failed nonviolent movements. You can also watch her webinar on the topic here. My 2008 article “Why Civil Resistance Works” with Maria Stephan, and our 2011 book of the same title. An edited volume by Adam Roberts and Timothy Garton Ash called Civil Resistance and Power Politics, published in 2010. Wendy Pearlman’s book Violence, Nonviolence, and the Palestinian National Movement. In this book, Pearlman is more interested in explaining the use of nonviolent or violent action, but she also makes the case that the choice of method has strongly influenced the outcome of the movement (with violent action leading to failure).